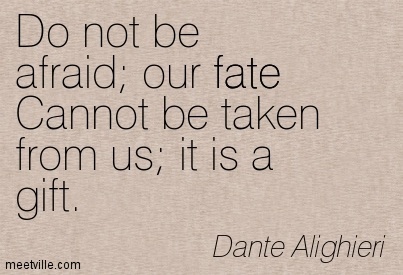 Durante degli Alighieri, simply called Dante (1265–1321) was a major Italian poet of the Middle Ages. His Divine Comedy is widely considered the greatest literary work composed in the Italian language and a masterpiece of world literature. Dante was born in Florence, Italy. The exact date of birth is unknown, although it is generally believed to be around 1265. This can be deduced from his autobiographical information found in the La Divina Commedia. It is in first section of the “Inferno” and begins, “Nel mezzo del cammin di nostra vita” (“Halfway through the journey of our life”), implying that Dante was around 35 years old, since the average lifespan was 70 years then. Some verses of the “Paradiso” section of the Divine Comedy also provide a possible clue that he was born under the sign of Gemini: “As I revolved with the eternal twins, I saw revealed, from hills to river outlets, the threshing-floor that makes us so ferocious”. In 1265, the sun was in Gemini approximately between May 11 and June 11. 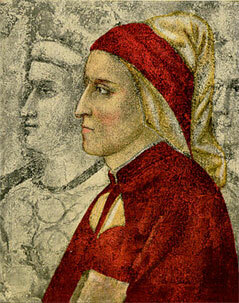 The poet’s mother was Bella and she died when Dante was not yet ten years old. His father soon married again to Lapa di Chiarissimo Cialuffi and she bore him two children, Dante’s half-brother, Francesco, and half-sister, Tana (Gaetana). When Dante was 12, he was promised in marriage to Gemma di Manetto Donati, daughter of Manetto Donati, a member of the powerful Donati family. Contracting marriages at this early age was quite common and involved a formal ceremony, including contracts signed before a notary. But Dante had fallen in love with Beatrice Portinari (known also as Bice), whom he first met when he was only nine. Years after his marriage to Gemma, he claimed to have met Beatrice again and he wrote several sonnets to her but never mentioned Gemma in any of his poems. The exact date of his marriage is not known: the only certain information is that, prior to 1301, he had three children named Pietro, Jacopo and Antonia. Statue of Dante in the Piazza di Santa Croce in Florence. 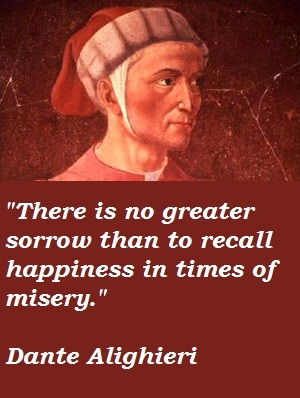 Not much is known about Dante’s education except that he studied either at home or at a school attached to a church or monastery in Florence. It is known that he studied poetry at a time when the Sicilian school (Scuola poetica Siciliana), a cultural group from Sicily, was a presence in Tuscany. His interests brought him to discover the poetry of the troubadours, such as Arnaut Daniel and the Latin classical writers, including Cicero, Ovid and especially Virgil. While still in his teens, Dante became involved with a group of poets, who would later be known as the founders of Dolce Stil Novo (Sweet New Style) poetry. The Divine Comedy describes Dante’s journey through Hell (Inferno), Purgatory (Purgatorio) and Paradise (Paradiso), guided first by the Roman poet Virgil and then by Beatrice, the subject of his love in another of his works, La Vita Nuova. While the vision of “Inferno ‘ is vivid for modern readers, the theological concepts presented in the other books require a certain amount of patience and knowledge to appreciate. “Purgatorio”, the most lyrical and human of the three, also has the most poets in it; “Paradiso”, the most heavily theological with the most mystical passages. With its seriousness of purpose, its literary stature and its range of content, The Divine Comedy, soon became a cornerstone in the evolution of Italian as an established literary language. Dante was more aware than most early Italian writers of the variety of Italian dialects and of the need to create literature with a unified literary language,in that sense, he is a forerunner of the Renaissance with its effort to utilize vernacular language. 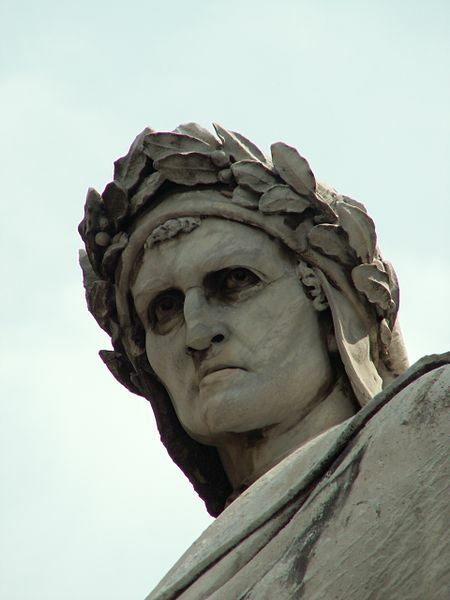 Dante’s knowledge of Roman antiquity and his admiration for some aspects of pagan Rome also point toward to the 15th century. Ironically, while he was widely honored in the centuries after his death, The Divine Comedy slipped out of fashion among men of letters during his lifetime. It was considered too medieval, too rough and tragic and not stylistically refined in the respects that the Renaissance came to demand of literature. He wrote The Divine Comedy in a language he called “Italian,” a literary language mostly based on the regional dialect of Tuscany, but with some elements of Latin and other regional dialects. He deliberately aimed to reach a readership throughout Italy, including laymen, clergymen and other poets. By creating a poem of epic structure and philosophic purpose, he established that the Italian language was suitable for the highest sort of literature. 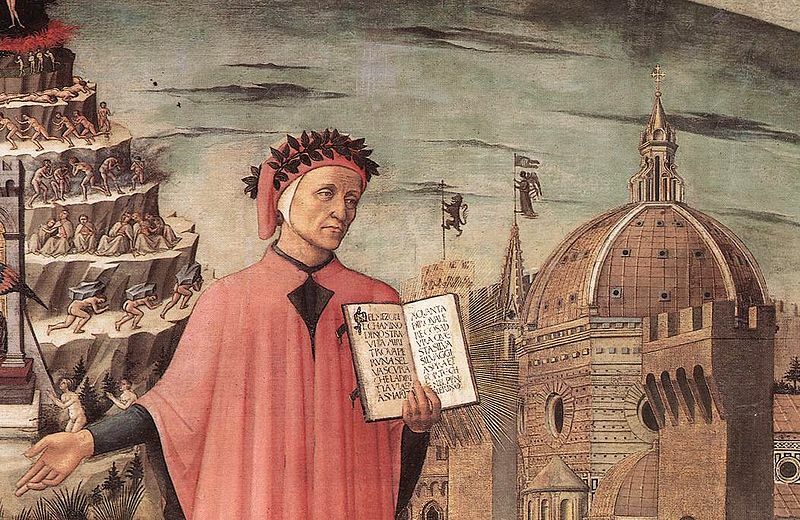 Publishing in the vernacular language marked Dante as one of the first (among others such as Geoffrey Chaucer and Giovanni Boccaccio) to break free from standards of publishing in only Latin (the language of liturgy, history and scholarship in general, but also of lyric poetry). This break set a precedent and allowed more literature to be published for a wider audience, setting the stage for greater levels of literacy in the future. However, unlike Boccaccio, Milton or Ariosto, Dante did not really become an author read all over Europe until much later. 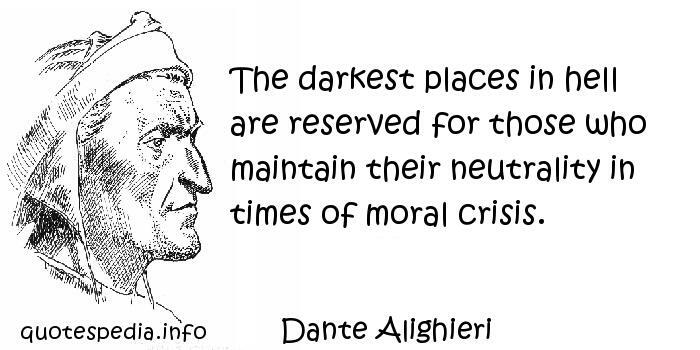 Throughout the 19th century Dante’s reputation grew and solidified and, by 1865, he had become solidly established as one of the greatest literary icons of the Western world. Dante is credited with inventing terza rima (a set or group of three lines of verse rhyming together) and chose to end each canto (sections of a long poem) of the The Divine Comedy with a single line that completed the rhyme scheme. The triple stanza likely symbolized the Holy Trinity and early enthusiasts, including Italian poets Boccaccio and Petrarch, were particularly interested in the unifying effects of the form. Readers often cannot understand how such a serious work as The Divine Comedy can be called a “comedy”. The word “comedy” in the classical sense refers to works which reflect belief in an ordered universe, in which events tended toward not only a happy or amusing ending but one influenced by a divine will that orders all things to an ultimate good. Using this meaning of the word, Dante wrote in a letter, “the progression of the journey from Hell to Paradise made by the pilgrim is the expression of comedy, since the work begins with the pilgrim’s moral confusion and ends with the vision of God”. Dante’s other works include Convivio (The Banquet), a collection of his longest poems with an (unfinished) allegorical commentary; Monarchia, a summary treatise of political philosophy in Latin which was condemned and burned after Dante’s death by the Papal Legate Bertrando del Poggetto, De vulgari eloquentia (On the Eloquence of Vernacular), on vernacular literature and La Vita Nuova (The New Life), the story of his love for Beatrice Portinari, who also served as the ultimate symbol of salvation in The Divine Comedy. The Vita Nuova contains many of Dante’s love poems written in Tuscan which was not unprecedented, since the language had been regularly used for lyric works before and during all the thirteenth century. Dante, poised between the mountain of purgatory and the city of Florence, displays the description: “Nel mezzo del cammin di nostra vita” in Domenico di Michelino’s painting in Florence, 1465. The heart of Florentine cuisine is simple and abundant with local produce, mellow cheeses and grilled meats. Tuscans are also known for their appreciation of beans, especially white beans cooked with sage and olive oil. Beef Steak Florentine, roasted or wine-braised game such as boar, deer and rabbit and thick and hearty soups cover the table of a typical Tuscan meal. Plus this is the home of Chianti wine. Pinzimonio is a typical appetizer and can be varied according to the season and the availability of vegetables. The success of this simple and tasty dish depends on two elements: fresh, young ingredients and, above all, superb olive oil from the hills of Tuscany. The vegetables come with a small bowl containing the oil, salt and pepper into which you can dip the pieces of vegetables. Ribollita -Tuscan bread soup is a classic comfort food; it’s hard to think of any dish that’s more intimately associated with Florence than ribollita, a classic cabbage-and-bean soup that gains body and substance from a generous infusion of day-old Tuscan bread. The word ribollita literally translates as reboiled and for a ribollita to be authentic it must contain black-leaf kale, a long-leafed winter cabbage whose leaves are a purplish green and which has distinctive bitter overtones. Stracotto – actually means “overcooked”, but in fact it is a good description, as it is intended for the tougher cuts of meat which require long, slow cooking. Before the discovery of America and the importation of tomatoes, stracotto was cooked with agresto – a sauce made from crushed, tart grapes, boiled and flavored with cloves, cinnamon and the juice of a squeezed onion. Piselli novelli in casseruola – is a speciality in springtime when tiny, tender, sweet new peas are available. They are ideal not only with stuffed rabbit but also with roast pork, peppery stew and braised beef. 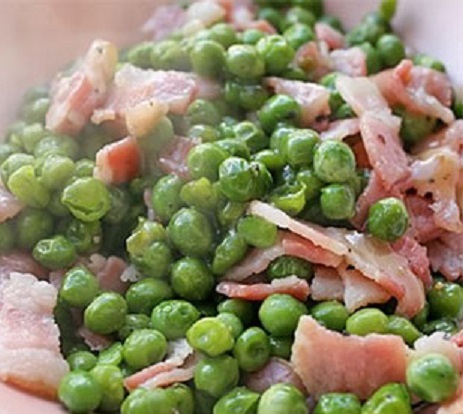 The dish is simply new peas cooked with pancetta and seasoning. Casseruola alla fiorentina – Pasta or noodles are covered with a sauce of spinach, cream of mushroom soup, garlic, tarragon and marjoram and pieces of sausage, which is in turn covered with an egg and ricotta mix. Castagnaccio – Chestnut cake For many centuries chestnuts were part of the staple diet in mountainous and hilly areas and for the poorer classes in general as they provided an inexpensive form of nutrition. The original, Florentine version of castagnaccio is also known as migliaccio (black pudding) in some parts of Tuscany. Preheat the oven to 375°F (190°C). Oil a baking dish. To make cutting the bell peppers into strips easier, you can first soften them by placing 2-3 at a time inside a small plastic bag and heating them up in the microwave for 2-3 minutes. The vapor that forms makes them soft and easier to cut and clean. Prepare the meat filling by pureeing the mortadella and prosciutto in a processor. Remove to a mixing bowl and add the bread crumbs and egg. Mix well. Add salt and pepper. Spread some of the filling on the bell pepper strips with the back of a spoon. Take one end of the strip and roll it up. Fasten with one or two toothpicks. Place the rolled up bell peppers flat on one layer, close to each other (you should see the meat filling from the top in the prepared baking dish. Bake for 20-25 minutes or until tops of rolls are slightly browned. Remove and let cool 10 minutes before serving. They may also be served at room temperature. 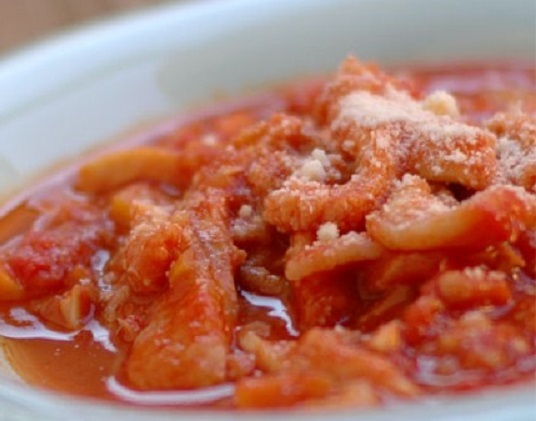 Tripe is a type of edible offal made from the stomachs of various farm animals. In a saucepan, heat the extra-virgin olive oil. Add the garlic, celery, carrot, and onion and saute until they are soft. Add the tripe and cook together on medium heat, for about 5 minutes. Add the tomatoes including the juices. Break up the whole plum tomatoes with a fork. Let the mixture cook together until the sauce has reduced and thickened, about 15 minutes. Remove the pan from the heat, season with salt and pepper, to taste, and add the freshly grated Parmigiano cheese and basil. Stir well and serve warm. In a 2-quart saucepan, cook the olive oil, garlic and pancetta for 2-3 minutes, being careful not to brown the garlic. Add the peas, water, salt and pepper and cook covered for approximately 15 minutes. Adjust salt and pepper, stir in parsley and serve. In a mixing bowl combine the flour, sugar, salt, and water. Whisk the batter well until the batter is smooth. Add the olive oil to a nonstick pie pan and heat in the oven for 5 minutes. Once the oil and pie pan are hot, add the batter. Smooth out the batter evenly. Sprinkle the raisins, pine nuts, rosemary and orange zest on top. Bake the cake for 10 to 15 minutes or until the top is golden. That rolled bell pepper appetizer looks especially tasty to me! Thanks Pam. 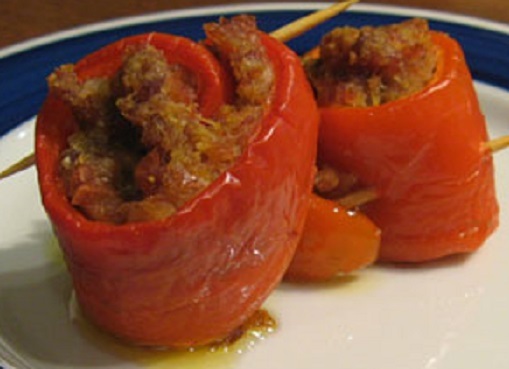 I love peppers with some kind of filling and these are easy to make. 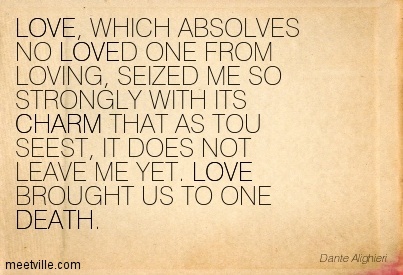 Dante was such a fascinating icon. A very interesting post! Yes, these men of talent do not lead ordinary lives. Thanks Mary. What a cool post! Food through the lens of Dante, one of my all time faves. I really love this! That tripe dish seems especially authentic. There’s a cookbook out now based on what they’re eating on the show Game of Thrones. Very cool. I’ll have to look at that cookbook – should be very interesting. Thanks Amanda for commenting on the man and his food. 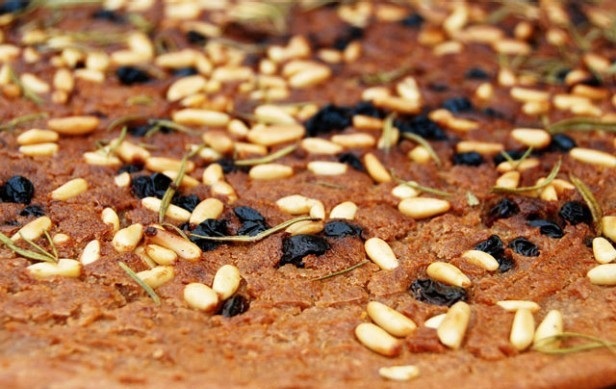 The chestnut cake is also very authentic – goes way back to ancient times – but probably not with raisins on top. Are these photos from your kitchen, btw? I always wondered if you actually make all of this for every post. Thank you. Do you have a similar recipe? No, so I am really happy that you posted. I have only enjoyed this dish at a local cafe. I so hope you like this recipe. Let me know. I have been making recipes for several years, photograph them and keep them in a media file. When I plan the theme of a post, I go through my media file anf fit the recipes to the theme. Sometimes I need to make and photograph a recipe if I don’t have enough.